This royal cherry poster Bedroom Set G2200A by Glory Furniture is traditional in design. Glory Furniture is well known for quality products at affordable price. 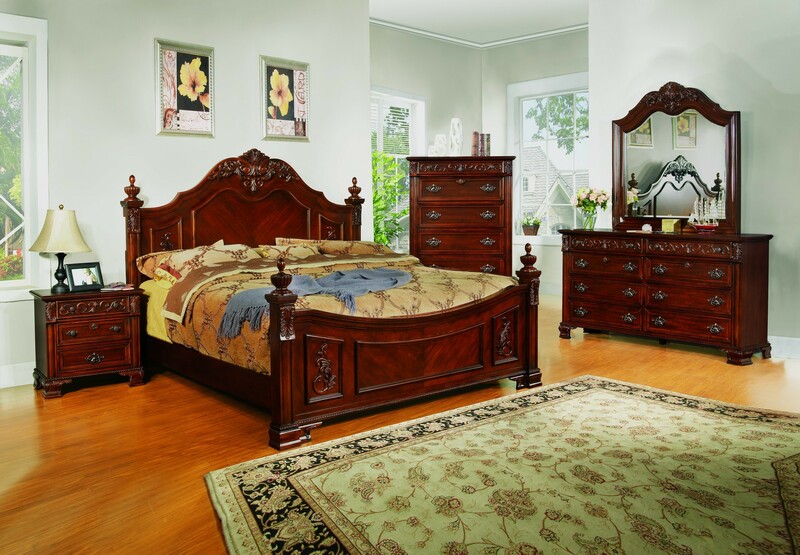 This grand bedroom set with decorative wood trim and molding is made of superior quality wood and is thus highly durable. Natural wood polish is used for this product. The uniqueness of this bed lies in its superb design and its storage system. The bed comes in two different sizes such as king and queen size. The bed has four designer posts to the corner and beautifully made traditional headboard that adds to the grand look of the bedroom set. The sleek chest and dressers have drawers which maximize the storage facility. The drawers are also beautifully designed with designer metallic hardware. The mirror which is used with the dresser is also a worth purchase, for it gives clear image. The six drawer dresser is also done beautifully complementing the bedroom set with a storage space for keeping accessories. The nightstand is a real showpiece and you can keep a beautiful night lamp on it.